Easily backup, synchronize, or restore your files to another drive, FTP server, ZIP file, networked drive, or removable media. 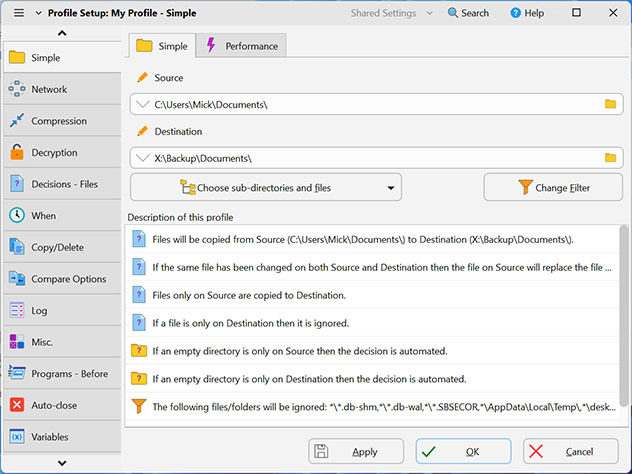 Highly configurable, SyncBack includes: detailed and easy to read log files; email results; simulated backups and restore; file filters; sub-directory selection; copy verification; background backups; auto-close of programs; easy and expert modes; profile groups; compare files, and an extensive context sensitive help file.As well as English, SyncBack is also available in French, German, Spanish, Catalan, Italian, Dutch, Polish, Brazilian Portuguese, Hungarian, Simplified Chinese, Traditional Chinese, Czech, Japanese, Danish and Finnish.SyncBack, developed by 2BrightSparks, is a multi-award winning solution with tens of thousands of users. SyncBack provides a dependable way of ensuring digital files are safe with a simple interface that enables the first time user to backup and save their valuable data within minutes. As well as an 'Easy Mode' for essential backup, restore, and synchronization tasks, SyncBack has an 'Expert Mode' that delivers advanced functionality. If you need to backup to an FTP server or network and email the results this is where you'll fine-tune the software.Help is always close to hand if you run into difficulties. A comprehensive context sensitive help file provides easily accessible instructions and guidance about all aspects of using SyncBack. Simply click a help button at the bottom of the window you happen to have open, and you'll get taken straight to the help page for that task. In addition an extensive Frequently Asked Questions section provides all the answers you're likely to ask when carrying out a backup, restore, or synchronization task. A lively public forum is also available at the 2BrightSparks website.